Take risks. Rock opposites. Start a riot with envy-inciting style. 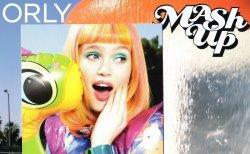 Now’s the time to blur the line between energetic and outrageous–with Mash-Up, the new Summer 2013 color collection from ORLY. Lose yourself in an environment high on hope: Where positive vibes abound. Optimism comes alive. 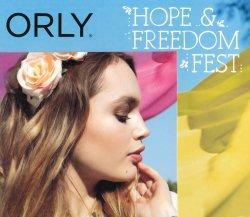 And music and spontaneity define the mood - giving rise to Hope and Freedom Fest, the new Spring 2013 collection. Surge forward with a live stream of techno color at your fingertips. Replicate your inspiration and let your impulses go wild. Limited Edition FX Collection formula infused with metallic particles to create designs and shapes on your nails using magnetic forces. Each shade comes packaged with a custom Magnetic Design Tool that is the key to create it’s unique nail design. 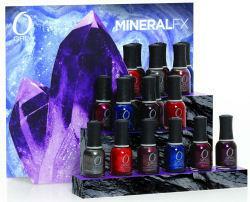 3 Easy Steps: To use, apply one coat of Magnetic FX Nail Lacquer over entire nail. While nail is still wet, hold the Design Tool close to nail without touching it for 10 seconds. The magnetic particles formulated in the lacquer will gravitate towards the magnet, creating a unique design on your nail! This collection brings bright tones to the forefront, inspiring an uninhibited and colorful summer mood! These fluorescent brights uplift and energize the spirit while providing high octane glamour. Color collection inspired by the movie Dark Shadows. Spring is here and love is in the air. Let your eccentric romanticism shine with the cool pastels of Cool Romance. Are you naughty or nice? Either way, you’ll love Orly's Holiday Soireé color collection - these aren’t your typical holiday shades! Longer, stronger color, anyone? High impact prismatic color infused with our exclusive Mineral Complex!